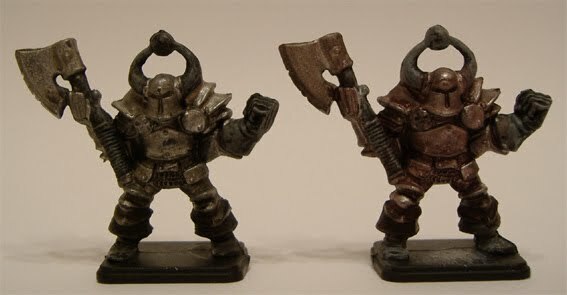 this article will bring you my thoughts of painting True Metallic Metal (TMM), which means painting metal on miniatures while using only colours with metallic pigments in it. 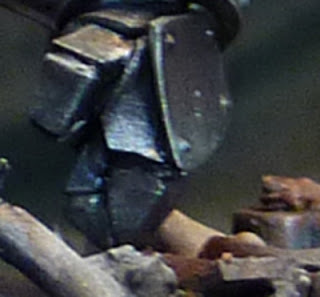 The other variant you can paint your metal up is called the Non Metallic Metal (NMM) and the future will for sure bring up a tutorial of this for sure on MASSIVE VOODOO. 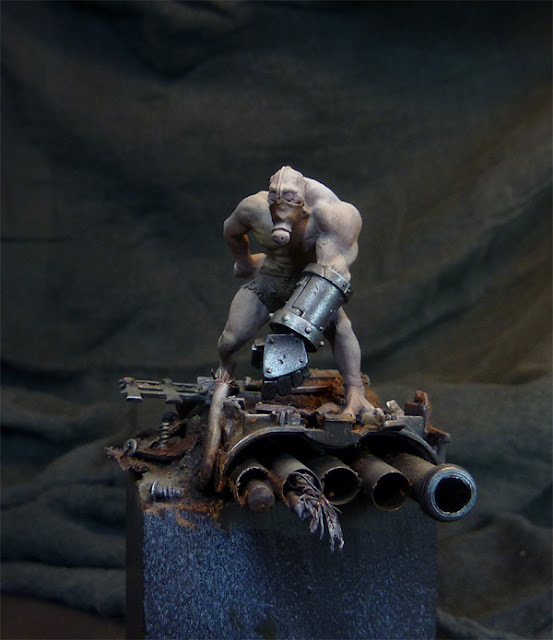 This tutorial will start from my Introducing thoughts over real basic techniques, quick options while working with metallics so you can easily realize those on your model and the article for sure goes up to options where you really can spent a lot of time on. In the end i hope every question will be answered with this tutorial if still some may appear - simply ask in form of a comment. For sure this is not the perfect way or the "Have to way", it is simple the way of the banana addicted guy writing this. 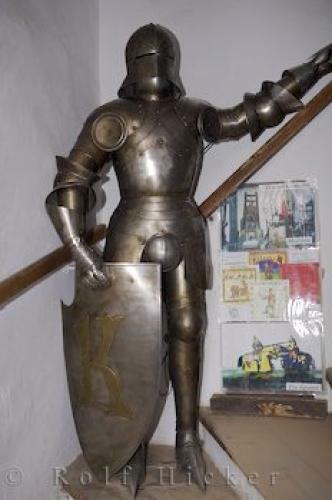 It is not aimed to some special metal, like "How to paint up gold?" 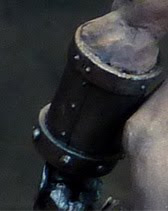 or "How to paint chainmail? ", it is more aimed to understand how you can work every metal tone you wish for and understand light and shadow on metals. Further articles will describe metals in special variants. For sure you must chose if the miniatures you paint up are for the use on the gaming table or being showcased afterwards. 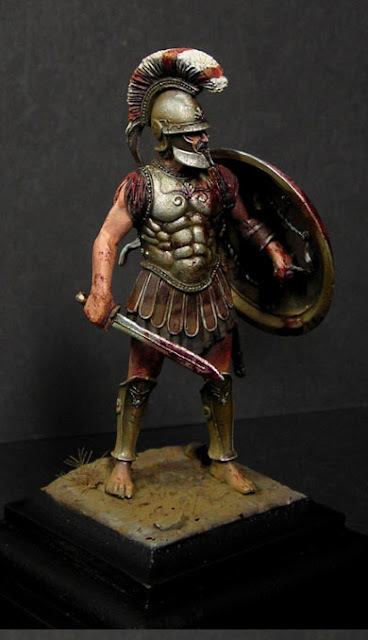 When painting up a hundreds of spearman i would not perform high end quality metals on every spear tip. I guess you got what i mean. 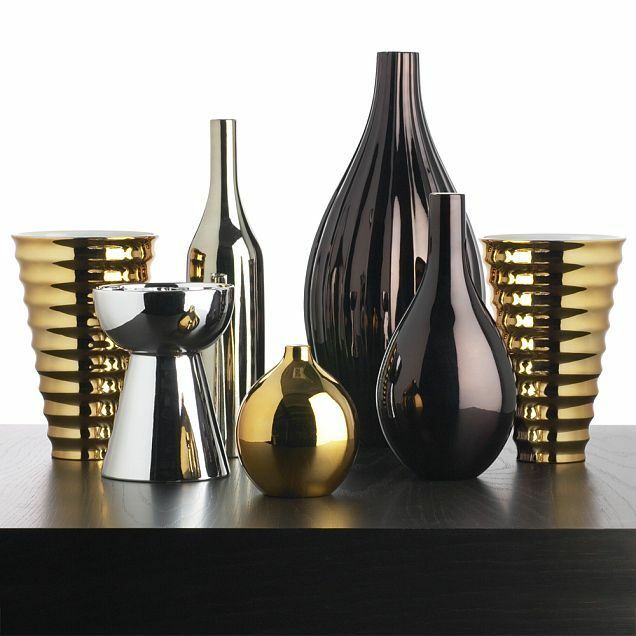 As you might see, light and shadow works different on metallics than it does on other materials like clothes or skin. Metall always reflects the light very intensive, hard edges from light areas to dark areas, for sure depending on the direction your light comes in at the area and for sure depending on how the metal area is standing in that light source. For sure it is also very important what metal object you are looking at. 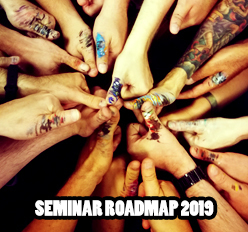 Now this is a lot of information and inspiration. Please keep in mind that we are still painting miniatures and not hyperrealistic things. 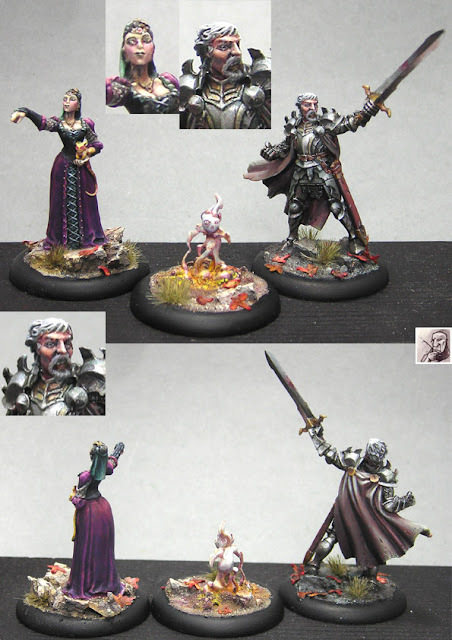 In the next steps i want to share with you my thoughts i've made over the years when it comes to painting TMM on miniatures. From the simple thougths to the complex ones. As i am always making experiments all the time i have worked my TMM in different ways over the last years. For sure i use a lot of different colours for it. I am sometimes buying new ones to test them and if i like the way the results end up i stay with them. 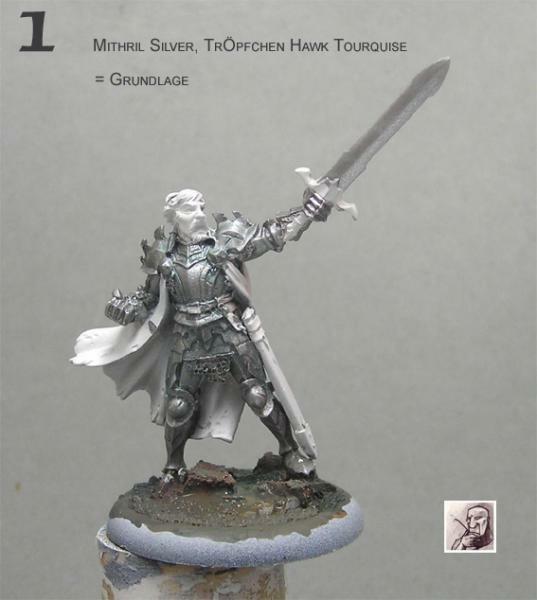 Mostly i use Games Workshop Citadel colours, especially mostly Mithril Silver and some metal tones from Vallejo Model Colour, like Oily Steel (70865), Bronze (70998) and Gold (70996). 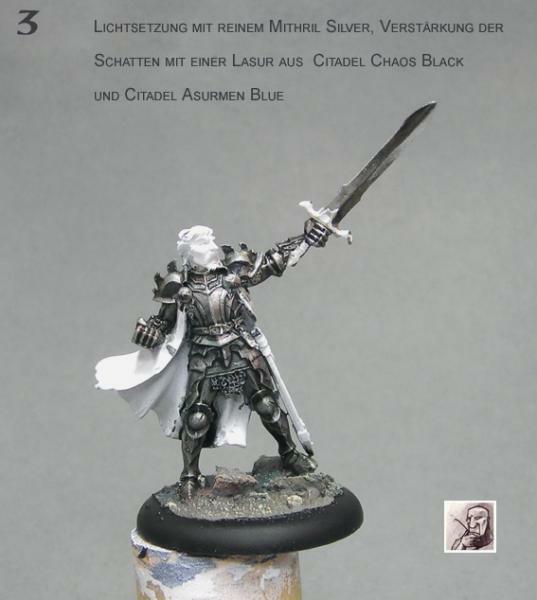 Also washes from Citadel are very nice to bring in a coloury touch and shadows to your metals. Also i love smoke from Vallejo Model Colour 70939 for an afterwards shading or even "in between the steps shading". 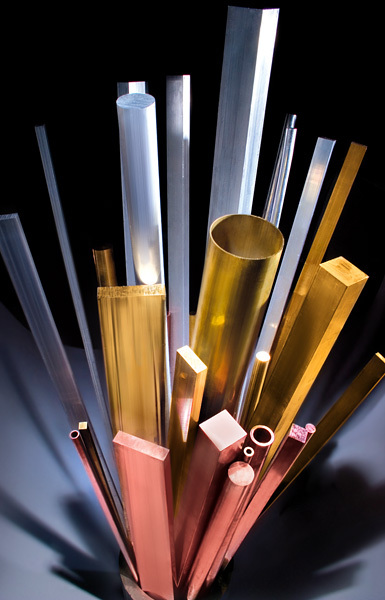 Always remember that the colour of your metal (bronze, gold, steel, etc.) 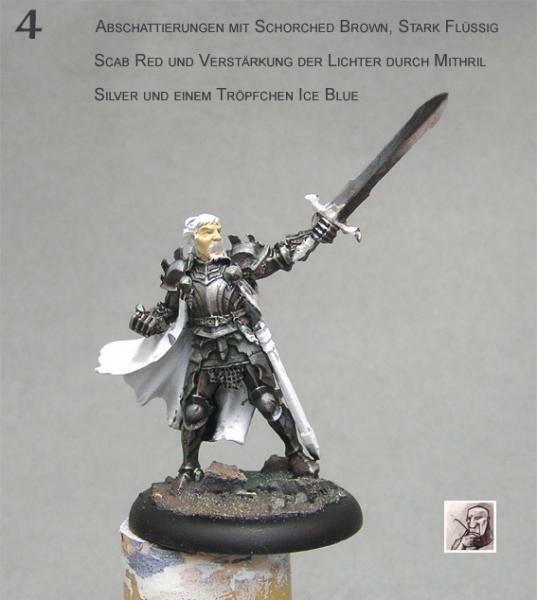 can influance your complete colour scheme on your model. I did stop thinking in painting pots to realize my metallics. I have learned for myself to mix the perfect tone i want to have by bringing in some "usual/normal" colours. Not shown: Gold can be made of from Snakebite Leather + MS, just for addition. With this i just want to show you how easy you can change up your colour palette, even in metallics to achieve way more tones coming from one basic colour (Mithril Silver in this case). For sure you can use every other metal tone to start from. Meanwhile i do this often starting from Oily steel fro example. Have a go at it and find out for yourself what you like the most. If you do so, then make sure that the lot of the metallic tone is always higher then the lot of the normal colour as if not you are stealing the metallic look of the colour. Important: When working with colours that have metallic pigments in it, always use 2 different glasses of water to clean your brushes. One for normal colours and one for those with metal pigments in it. You don't want to have metal pigments in your skintone next time, really you will really dislike this accident. First i have learned that only painting something metallic doesn't mean it looks like metal. 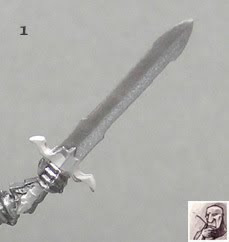 For example painting a sword only in mithril silver or Boltgun metal, will at last make it look silver. 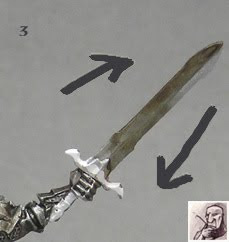 Now you got a silver sword, but when remembering the pictures/references above there is much more to it than only painting it with one colour. Next step is a wash from badab black over the left one, Baal Red on the right one, both thinned with a drop of water. Now i just switched the washes, Baal red on the left, Badab Black on the right. Now this is really very simple, but can bring fast results. 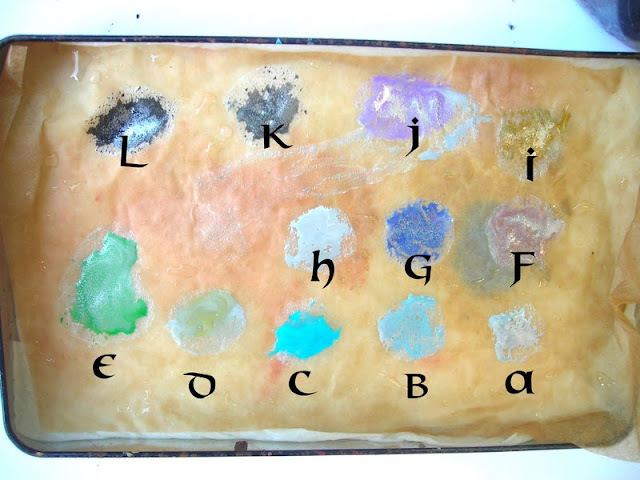 Try to test around with different washes over your metallics for example also mixing different colours into it like a water thinned wash of Vallejo's Smoke with a tip of Regal Blue in it or something like that. There is no limit when it comes to testing. The way mentioned above is really something bringing fast results. For sure you can add more detailed attention to the areas shown above afterwards. 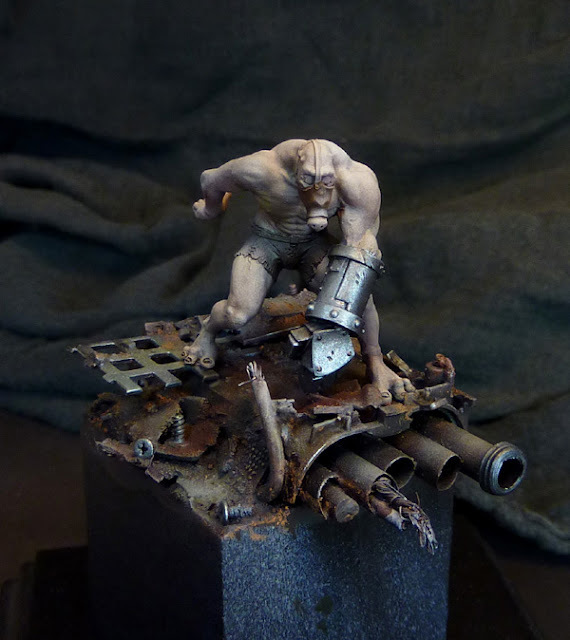 There is no limit on your time spend on a miniature. 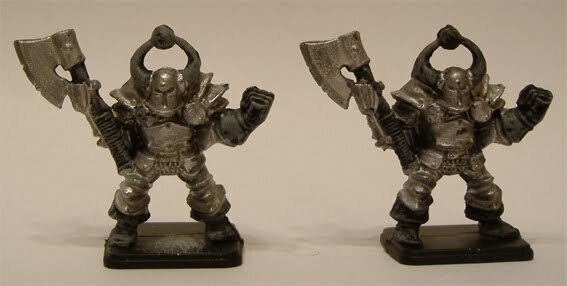 ... you might see that painting up good looking metal on your miniatures will need a bit more work than the fast version. 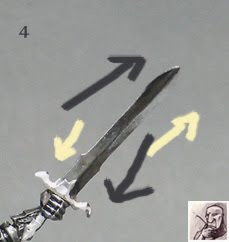 If you are up to this, then check the pictures again and you might get the intense light/shadow situation working on metals i have mentioned high above. With knowing this you can now go studying how light brakes on metals and edges and stuff. In this Tutorial i will not go that far as still another light tutorial is missing in the Tutorial Section. The science of light and what it does to different materials will be a part of another tutorial coming in the future. 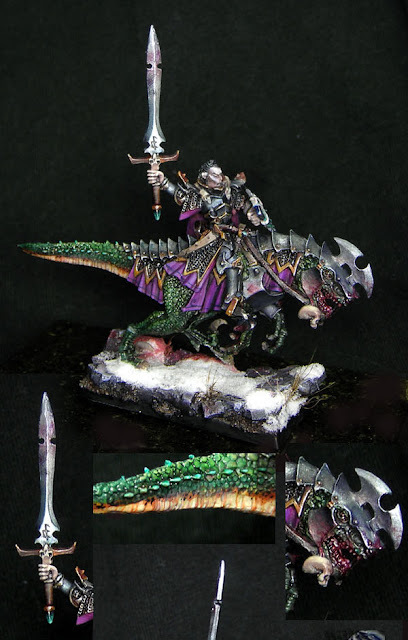 I want to show you 2 ways on how to spent more time on your metallics and make a good looking result for the moment without bringing your brain to shut down. At this point we focus on dark areas lying beside really bright areas when looking at metals. I hope you get me this far with the shown references. Here i have described how to work from a bright colour to the shadows and from the shadows to the brighter parts, you have to scroll a bit as far as i can remember. 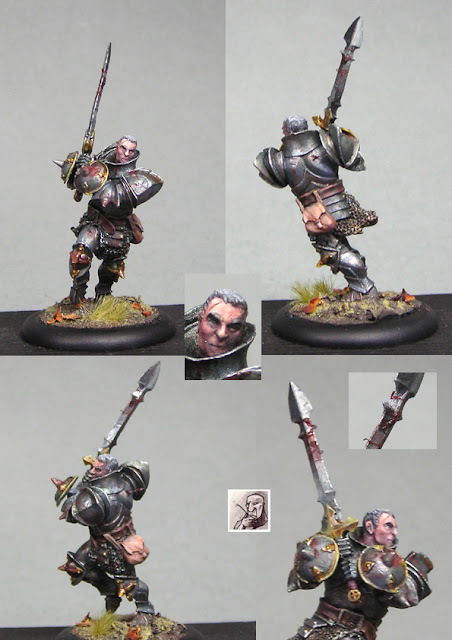 As for the go with bright tones to dark tones i will use this following guy, Götz from Berlichingen from the game "Helldorado" in 28 mm, whom i did paint in the early year of 2009, upon a white priming basecoat as i had no black primer at hand. Next go has been bringing out the lights again which faded a bit from the shading with pure Mithril Silver. I also did intense the shadows lying next to a bright area with glazes of Chaos black + Asurmen blue. 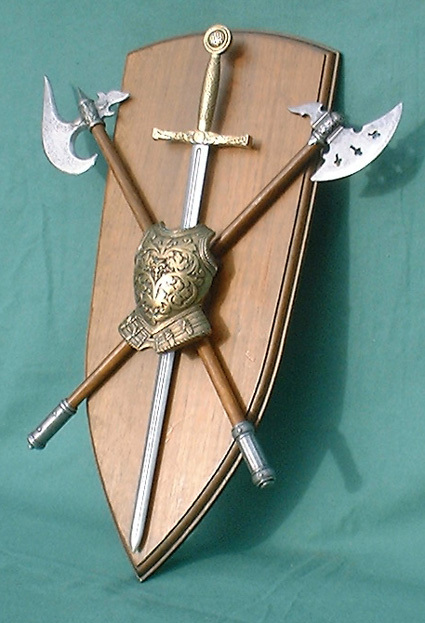 Don't look at the sword at the moment, i'll explain this further on. As always it says the same in german on the picture what is written here. A tip of ice blue has been added to the final lights with Mithril Silver to create some kind of illusion, showing the lighter parts reflecting the skyish blue. For the darker areas i have added a tip of Schorched Brown/Scab Red to the last shadows and glazed them into the armour parts showing the illusion of reflecting earth. The edges have been set out again with some pure Mithril Silver. 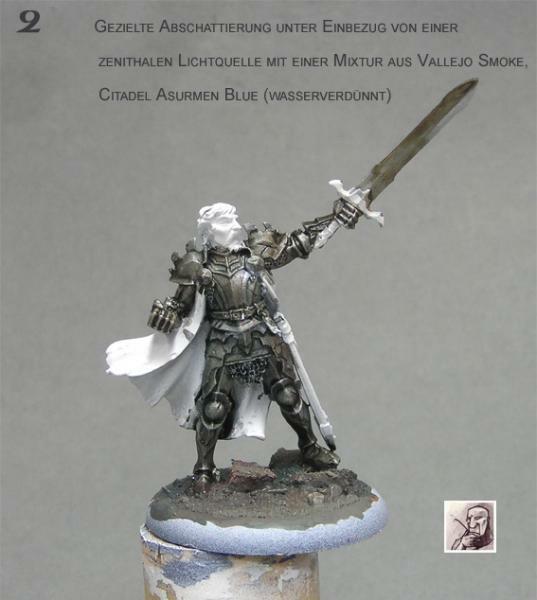 If you still want to go a bit brighter you should take a chance with Plata from Vallejo Model colour, it is even more brighter than Mithril Silver. 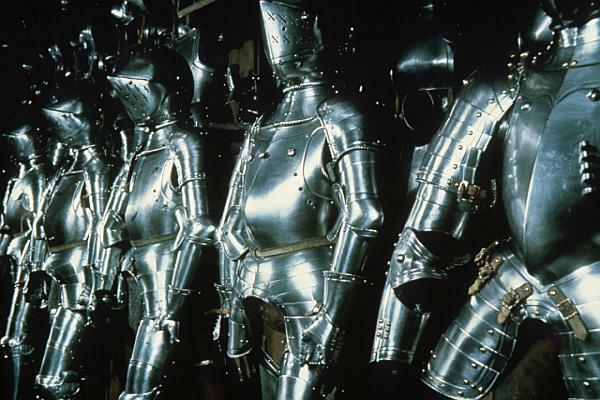 Armour finished at this point. Cleaning up the mess in the middle with the tone in the middle and bringing in some glazes of red. 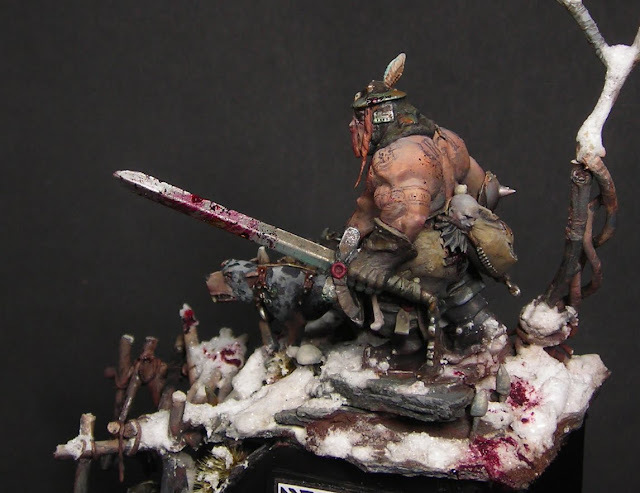 I have to mention at this point that this model has been painted up a while ago and i did it leave it that way. Today i would say i could do this better from the experience i have gained. 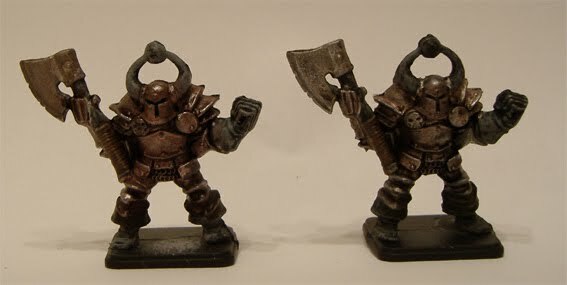 If you don't want your last glazes mess up everything like happened here with the red glaze mix in some metal tone in your wished coloured glaze (, red, in this case the bright metal tone) to not achieve a this matt finish and stay focused of the shiny metal parts in your colour. Doing metallics completly in the different direction means only that i just switch the way i work myself from light to shadows into shadows to light. Using the same idea as above only switched. I hope everyone can follow my thoughts. Ok, i'll give that up. Can't get good photos of this thing here, arrrrrgggghhhhh. I can only tell you that i have tried to bring the brighter metal tones in always smaller areas to the final light of using pure mithril silver to the brightest parts and the final edges and used some glazes of Oily steel + a tip of Chaos Black/Regal blue for bringing in some glazes to intense the dark areas again... i'll give it up. I hope no one gets mad at me and still can follow my brainless thoughts in here, sorry. Nargh, nargh, nargh... ahh! Ok... i am waiting for your comments on this one, haha. 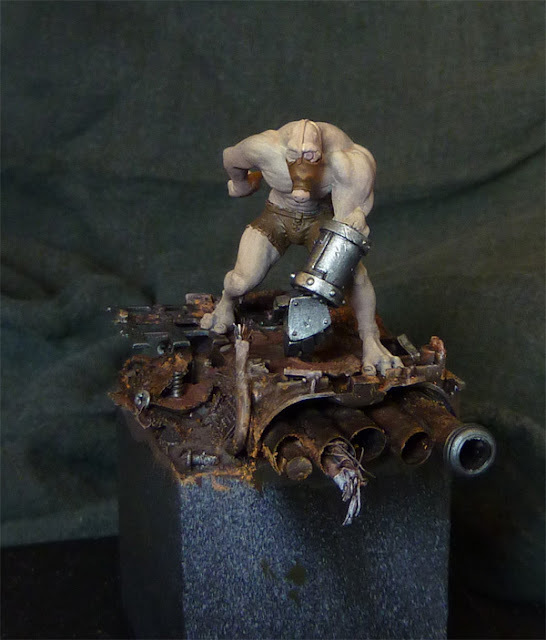 As mentioned above this article shall bring you some basic thoughts and methods how to work on your metallics. Specific goes on different metals will follow in the future in the article section when the muse guides to this path. 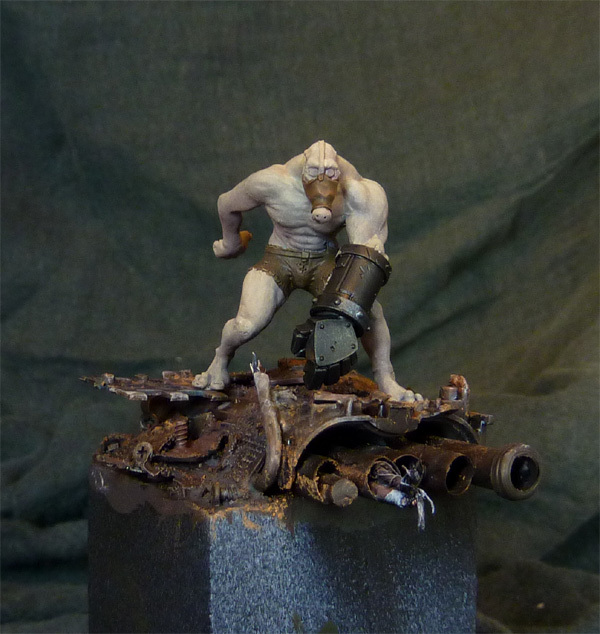 I hope you enjoy... Kong is still pissed of that camera/true metallics thing... argh! Thanks, this tutorial looks very helpful. I appreciate the Work with flash, but damn its so fast fast. 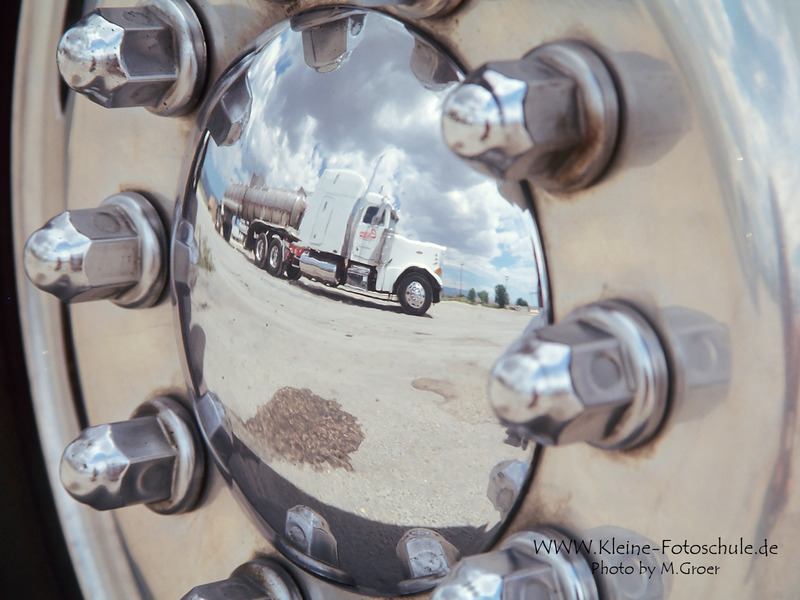 The 360° view is awesome! 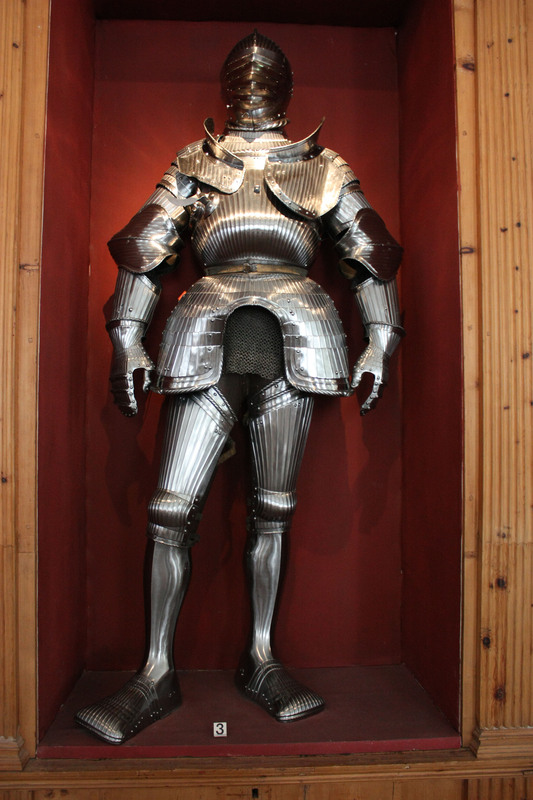 Looks fantastic, you can see the light refelctions on the armorplate very well! Hi Jim, that has been a hell of a work. We did take about 36 pictures of the miniature standing on a table which we manually turned, then Raffa did bring those together with Flash... not easy to describe for me as i am not the real computer and equipment nerd. It is about Raffa, when you know him you think you can easily catch up with the Enterprise and Captain Picard... maybe he can help a bit more. The latest 360° views you can see on the blog are done with a HD videocamera, on a stative while an automaticly turning table moves the miniature... urgs... that is no pleasing answer i know, but you can call me the klingon of computer technology... roaarr! 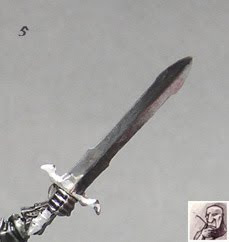 Is there a gw equivalent to oily steel? Also, great tutorial thanks a lot! For the glaze used, would you have a rough mixture quantity eg. 6 parts water / 1 part Mithril Silver? Or would that vary depending on the color? When you say a 'A tip of ice blue has been added to the final lights with Mithril Silver' what is meant by 'a tip'? The hair of the brush have a tip and I did not use the whole brush to pick up the colors more just the tip of it. I mean a small amount by using this describtion. 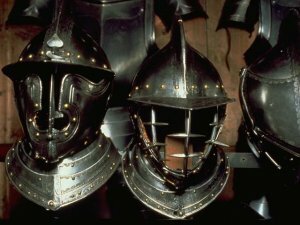 What's the best way to thin metal paints? 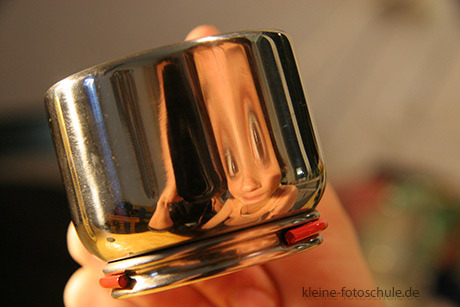 Metallics are known to be "clumpy" and the metal particles more easily fall out of the medium than typical paints. And THANKS for the sword tutorial! Gonna study up on them dwarves! I thin them with water. If you have the clumpy problem try Vallejo Air Model Colors, the metallic ones, shake them properly and you'll have a metal color for painting with your brush that you don't have to thin and without being clumpy! Thanks! 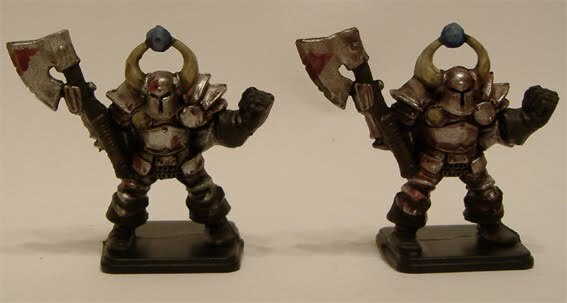 I'm now painting my HeroQuest miniatures, and am curious what steps you took to get to the first Chaos Warrior picture. 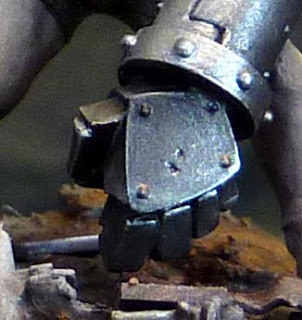 The text sorta says a chainmail basecoat was applied, but it looks like the glovers and non-armor parts have a grey drybrush, and the basecoat was applied to let some of the black primer show through as shadows?? As always, a great Tutorial! Do you have an idea on how to paint damascus steel? I can't find any information on that. Tutorial - What colours to use?